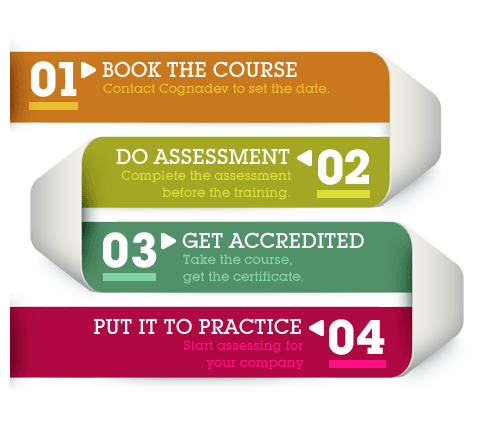 Discover why Cognadev’s assessments are cutting-edge and practically applicable. Become part of our team. Becoming accredited in our psychological assessments will help you make the right business decisions, develop your professional repertoire and contribute to the growth of others. Psychological assessments can be complicated, we provide the tools to simplify the process. Contact us to book the course and we will provide the information to guide you through the process from accreditation to application. All our courses are CPD accredited. More about the training on offer. Learn more about the training below by selecting your course. A pre-requisite for attendance of CPP course is a professional registration in psychology or psychometrics and work experience in HR, counselling, consulting and/or coaching. Previous exposure to and use of assessment techniques in an integrative and holistic manner is thus required. The application of the CPP constructs in the work environment is addressed. The course involves theoretical and practical work. The research findings are discussed. A CPP training manual is provided. Certification and accreditation takes place with successful demonstration of an understanding of the theory and practical implications of the cognitive constructs. A pre-requisite for attendance of the LOI workshop is professional registration with a relevant psychological governing organisation, completion of the LOI assessment, experience in psychometrics or psychological assessments and the application of an integrative and holistic approach in the use assessments. You also require to have completed the CPP training. Experience in the field of career guidance would also be useful. The course aims to assist the practitioner to develop the ability to interpret results, give effective feedback on the LOI results, and apply the results in an ethical within the educational or work contexts for selection, guidance or developmental purposes. Certification takes place with successful demonstration of an understanding of the theory and practical implications of the cognitive constructs. Since the constructs of the CPP and LOI overlap, CPP accreditation contributes towards LOI licensing. A one day LOI training course applies for licensed CPP practitioners. Like for the CPP, there is a compulsory refresher workshop for updates on recent developments on the LOI. A pre-requisite for attendance of the VO workshop is a professional registration in psychology or psychometrics and work experience in HR, counselling, consulting and/or coaching. Previous exposure to and use of assessment techniques in an integrative and holistic manner is thus required. Knowledge of the literature on consciousness is particularly useful. Certification takes place with successful demonstration of an understanding of the theory and practical implications of valuing systems after completion of a one day VO training course as well as interest in and an understanding of related theoretical models in psychology. A pre-requisite for attendance of the MP workshop is a professional registration in psychology or psychometry and work experience in HR, counselling, consulting and/or coaching. Previous exposure to and use of assessment techniques in an integrative and holistic manner is thus required. Knowledge of depth psychology and Jungian theory is particularly useful. Certification takes place with successful demonstration of an understanding of the theory and practical implications of the motivational constructs after completion of a two day MP training course as well as additional independent exploration of related theoretical models. A prerequisite for attendance of the CCM workshop is a sound tertiary educational background and work experience in HR. Professional registration is not a prerequisite. Previous exposure to, and use of psychometric tests is a bonus and will enhance understanding and application of the product. Knowledge of the CPP instrument is most useful, hence the recommendation to attend the 2 day CPP training course prior to CCM training. The CCM course explains and demonstrates the online questionnaire-based job-analysis system to HR practitioners and Consultants by which they can facilitate job experts to clarify work-related competency requirements. Cognitive, Intrapersonal, Interpersonal and Functional competencies are measured. The CCM also provides a person-job matching facility to optimise organisational structuring, as well as people placement and development initiatives. develop competence in understanding for interpreting the various CCM reports in an informed and ethical manner. to enhance the practitioner’s skill in integrating the CCM findings with additional information provided by 360 degree and other psychometric assessment results. to implement CCM results to ensure optimal people-job fit. The above information is critical to inform personal-, team- and organisational development and transformational initiatives and to explore growth opportunities.